Dr. Avril Kinsey is an award winning musician, published composer, author and lecturer. She is the Founding Director of CTAMusic & Film. She was awarded the degree Doctor of Music from Nelson Mandela University. She is the first female classical guitar/composer to be awarded the creative DMus in Composition degree in South Africa. The Cape Town Academy of Music (CTAM) and Film, which Avril founded in 2000, is a boutique academy specialising in music education. International accreditation is through Trinity College London exam work. CTAM & Film offers several instruments and voice, as well as theory of music, songwriting and composition classes. In other NEWS Dr. Kinsey has been invited to lecture on South African composers for the classical guitar at the Guitar Foundation of America Festival in Miami, USA in 2019. Also in 2019 Dr. Kinsey has been awarded a prestigious composer’s residency in Visby, Sweden. 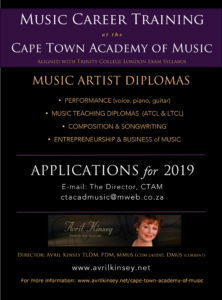 To apply to study part time at CTAM you need to go through a consultation/audition, but first please kindly send an email to the Director at: akinsey@mweb.co.zaIn this email please include your age, instrument of choice (piano, guitar, violin or voice) and the area you reside in, and whether you have had any experience or not. All students will be auditioned before acceptance. Parental support is essential for students still at school, no matter, their age or level or talent. Full Time studies are available in MA Dip, ATCL and LTCL teaching diplomas and practical performance diplomas, as well as theory and composition studies for school leavers and young adults. To apply you need to go through a consultation/audition, but first please kindly send an email to the Director at: akinsey@mweb.co.za In this email please include your age, instrument of choice, area you reside in, your matric or latest school percentage, as well as current level of music achievement. The Associate Trinity College London (ATCL), and Licentiate Trinity College London (LTCL) Teaching Diplomas can be done full-time, or part-time from ANYWHERE in the WORLD with Dr Kinsey’s long distance SKYPE course options, which includes course supervision, marking of written materials, assessments on observed and actual lesson teaching, as well as editing services. How do we apply? We set up a consultation/audition at which the student can ask all manner of questions. We get to know your aspirations, goals, and levels of achievement and we advise accordingly. Do you offer bursaries? Yes, we do have a limited number of bursaries for talented deserving students in the second year of study. We cover 50% of deserving student’s international Trinity exam fees in any year of study. Is it possible to work while studying at CTAM? Yes, the courses do allow students to do part time work, as long as it does not interfere in the student’s overall progress and submission of work. We encourage work in the creative and performance arts. Does the academy offer accommodation? We are not a large facility, so students generally find their own accommodation. What are the costs? Fees are worked out based on the number of subjects the student takes, and start from as little as R7200. per year. Fees are subject to the length of the class, whether they are one on one lessons or group classes. What is the registration fee? The registration/administration fee is also the consultation fee. So for an extensive consultation you have also covered your once off yearly fee of R330. Students can study: MUSIC PERFORMANCE and/or COMPOSITION, MUSIC EDUCATION (theory and practical teaching), MUSIC JOURNALISM, ENTREPRENEURSHIP and the BUSINESS of MUSIC. Read the CTAM PROSPECTUS for details. Consult with Avril regarding one on one lessons, group classes, Skype lessons, or to find out if you qualify for acceptance into any of the Music Artist Certificate courses. Send an e-mail with QUERY CTAM in the subject line to: info.akinsey@mweb.co.za Please include your contact information and as much detail as possible, or download the CTAM PART Time Application form or CTAM FULL Time Application form and/or complete the form below and we will get back to you in 24 hours.